Gotham Cigars Holds Special Closeout Deal for the Bugatti Metallic Blue and Metallic Dark Red Lighters. “A deal like this only comes around once in a blue moon,” said Manny Balani, president of Gotham Cigars. The Bugatti metallic blue and metallic dark red lighters are being closed out at Gotham Cigars for $39.99, a savings of $96 for the customer based on the standard retail price. “A deal like this only comes around once in a blue moon,” said Manny Balani, president of Gotham Cigars. Bugatti lighters are premium butane lighters that are designed in Germany and built in Switzerland, using only high quality materials. The Bugatti lighter is made from durable lightweight materials, making it great for portability. The Bugatti Lighter also comes with a 3-year manufacturer’s warranty that covers mechanical parts only. The Bugatti brand has become a symbol of style and excellence both in the luxury car and premium cigar industries. The Bugatti brand stands for a tradition of elegance and cutting edge technology, as both the car and lighter feature a sleek, innovative design to complement the quality materials used in the manufacturing process. Bugatti lighters convey a sense of style and elegance that is usually reserved for the cigar connoisseur rather than the average cigar smoker. 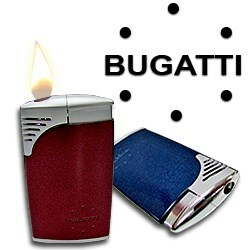 Gotham Cigars is featuring the Bugatti lighter at a closeout price for a limited time only.